How long have you been homeschooling? What ages/grades do you teach? We have homeschooled all of our children and graduated the first one last May. He now attends a community college while working in a steel mill. We still homeschool the other three children, who are in grades 11th, 10th, and 8th. What is your favorite or least favorite subject to teach? My favorite subject to teach? Surprisingly, government. I despised it while in high school myself, but I love teaching it. Up until three years ago when I began volunteering with IAHE, I felt that gaining a good grasp on government and politics was beyond my reach. However, the volunteers at IAHE pulled me in and taught me how I could understand how our government works and just how I could contribute. Now, with this being an election year, the three children that I still homeschool are all taking government together and we are learning more of how we can make a difference! What is your favorite aspect of homeschooling? My favorite aspect of homeschooling is how we are always together. There are times that I need some quiet to recharge but for the most part we are a pretty close family. 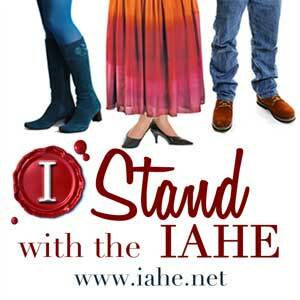 What is the most important thing that you think IAHE does for Indiana homeschoolers? My husband and I joined IAHE in order to do our part to protect the wonderful homeschool freedoms that we enjoy here in Indiana. I have learned the political process and now read and track bills to ensure that not even a small regulation gets passed to restrict homeschooling freedoms. I work with a phenomenal team of volunteers who devote several hours each and every day of the legislative session to watch for any threats. To me, this is the most important thing that IAHE does. However, serving homeschoolers as a state organization is a close second! How many? Too many to count. I am a convention devotee! What is your favorite part of the IAHE convention? The exhibit hall has always been what I love most about Convention. I absolutely love tweaking a subject or two each year by choosing new board games and supplemental materials or by completely switching up curriculum for a child who needs a different approach. I love to have the opportunity to get my hands on curriculum and "see it before I buy it." And I must recommend that parents who are looking to tweak a subject attend both days of convention, spending the first day browsing and narrowing down without purchasing and then spending the second day investigating the final choices and choosing the best one. Publishers' workshops are extremely helpful in narrowing down choices too! Plus those publishers are often readily available to answer questions at the booths as well. Who are you most looking forward to hearing at this year's IAHE convention? As a volunteer, I get the perk of meeting speakers behind the scenes and sometimes lunching with them. This is a wonderful opportunity to get to know them on a different level as I begin to "age out" of the need to change curriculum. What a joy it is to hear their hearts - and to witness their desire to help homeschooling parents! A favorite speaker? I have too many to name but I am looking forward to hearing what our teen speakers have in store for our teens this year! Their names will be released very soon and I am thrilled at the lineup!